Located approximately 10 nautical miles away from Redang Island in Terengganu, Bidong Island and surrounding islands can be dived by special charter from Redang Island or by liveaboard boat. There are as yet no accommodations or dive operators in the Bidong archipelago but this is sure to change soon. The island was closed to tourists until 1999. It was previously used as a refugee camp for Vietnamese boat people who landed in Malaysia and were then resettled in other countries which is why the island is often referred to as “Little Saigon.” Over a quarter of a million Vietnamese passed through Bidong Island. The camp was closed in 1991 but remained off limits to tourist until 1999. In those 8 years nature reclaimed much of the camp buildings. The future development for the island is still unclear. Divers have been exploring the area though and several quality dive sites have been found around the surrounding rocks and islets, most notably Pulau Yu Besar and Pulau Yu Kecil. Visibility is usually good around the Bidong islands, averaging 20m but often as good as 30m. Large schools of fish are encountered including trevally and snapper. Pelagic species include tuna and mackeral and barracuda. Hard and soft coral reefs are healthy. 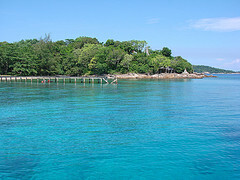 Kapak Island has an impressive dive site called Blue Garden which is full of magnificent blue anemones. Pods of dolphins can often be seen in the waters around the islands. This is an area that requires much more exploration. The best time to dive is March to September.